At Hog Island Oyster Co. good things grow slowly. Their goal is to develop sustainable aquaculture techniques to produce superior shellfish that taste wonderful while building a community of like-minded people. 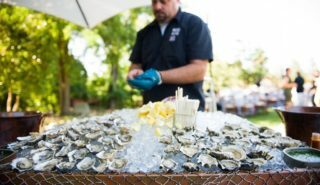 They take great care in everything they do, from cultivating oysters to the ways in which they work with the environment and finally how they present their product to you. Called “Bay to Bar” philosophy – every step is important and they want to ensure that they always meet the high standards that they set ourselves. Tamales Bay is home to where they harvest, shuck and share great oysters. Slurp one of our oysters from its shell and you’ll understand why they’re so passionate.